The above image is a small version of a wallpaper I just made. The art is scanned from Uncanny X-Men #518 by Terry & Rachel Dodson. This panel shows Emma Frost as she appears in the mind of Scott Summers as he is battling slivers of the Void (evil alter-ego of the Sentry)for control of his psyche. Click here for the full-size 1920×1200 version. Or here for a 1680×1050 version. I am considering making wallpaper posts a regular/semi-regular thing. I have several hundred I’ve made from my own scans & make new ones often. If it seems like there is enough interest I’ll start posting these. Most are sized 1920×1200. It’s pretty trivial to add a smaller 1680×1050 version if it seems needed. Please post/email me your thoughts on this. Let me know! 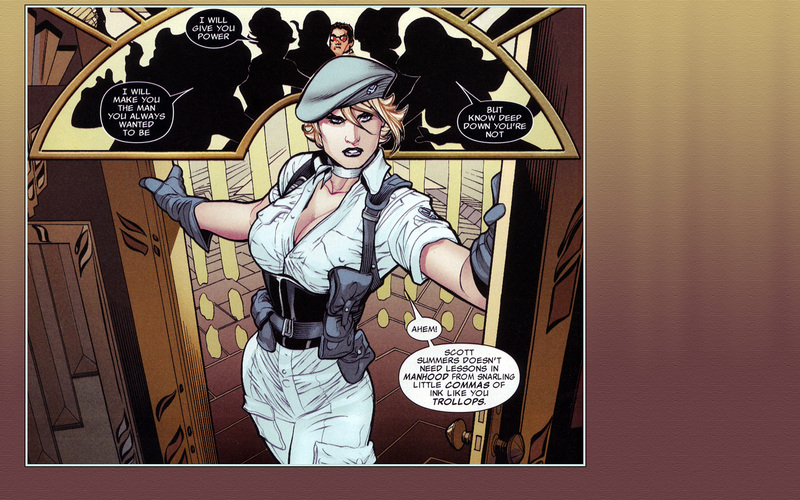 At the risk of showing my Marvel ignorance, just who is ‘Emma Frost’?? She is a mutant with “Omega Class Telepathic ability”. She also has a secondary mutation that allows her to turn to diamond form. While in diamond form she can’t use her mental powers though. In her first appearance (Claremont, Byrne – 1980 – Uncanny X-Men run) she was a villain. She was the “White Queen of the Hellfire Club”. Years later she “reformed” and joined the X-Men. She started teaching at the school and eventually fell in love with Scott Summers. They have been officially together ever since Jean Grey was “last killed”.